Dropping a bombshell, Sachin Tendulkar has disclosed that former India coach Greg Chappell had made a “shocking” suggestion to him to take over India’s captaincy from Rahul Dravid months before the 2007 World Cup in West Indies. Shikhar Dhawan feels Team India is “fortunate” to have three options for the opening slot in him, Ajinkya Rahane and Rohit Sharma, especially with the World Cup around the corner. “We are very fortunate that we’ve three openers. It’s a good sign for the team that openers are scoring runs consistently. It’s important to have a strong base whenever batting first or chasing,” said Dhawan. A defiant Steve Smith tried to delay the inevitable before Pakistan crushed Australia by 356 runs in the second and final Test to complete a 2-0 series victory in Abu Dhabi on Monday. The Justice Mukul Mudgal panel today submitted to the Supreme Court its full and final probe report on allegations of betting and spot fixing in cricket matches of the Indian Premier League (IPL) 2013. The SC had asked the panel to conduct further investigation into the charges after preliminary investigations had indicated possible connivance of the then Board of Control for Cricket in India (BCCI) president N Srinivasan and the involvement of 12 leading cricket players. Look at how we treat our athletes — Tintu Luka, the Incheon Asian Games medallist, was seen removing mud from the track before the start of her 800m final at the National Open Athletics Championships here on Monday. Tintu, the national record holder in 800m, was more worried about the injury she was likely to pick up on a poorly-kept running track at the Jawaharlal Nehru Stadium than plotting the downfall of her competitors in the season-ending meet. 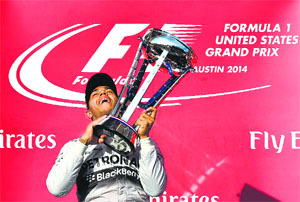 Six years to the day since he won the world championship in Brazil, Lewis Hamilton took another giant step towards a second in Austin on Sunday with a narrow but dominant 10th victory of the season over Mercedes teammate and title contender Nico Rosberg. The last-minute pullouts by athletes from the 54th National Open Championships has not gone down well with the Athletics Federation of India, which has decided to impose heavy sanctions on them at its next Annual General Meeting. John Goossens struck a last-gasp goal to help Pune FC beat NorthEast United 1-0 in a hard-fought Indian Super League here today. Having crossed the Wagah border just hours before yesterday’s blast, the Pakistani hockey teams playing in the ongoing Olympian Surjit Hockey Tournament had barely checked into their hotels here when they heard the tragic news. Indian Oil Mumbai beat Rail Coach Factory Kapurthala 5-3 and Punjab Police Jalandhar beat Bharat Petroleum Mumbai 4-2 to earn full points in the 31st Surjit Hockey Tournament. “Together, we could control Indian cricket for years”, the Australian told Tendulkar during a visit to his home when he offered to “help me in taking over the reins of the side” from Dravid, the master batsman writes in his autobiography Playing it My Way due for release on Thursday. Tendulkar is scathing in his criticism of Chappell who was the national coach from 2005 to 2007, describing him as a “ringmaster who imposed his ideas on the players without showing any signs of being concerned about whether they felt comfortable or not”. Elaborating on the coach’s bid to replace Dravid, Tendulkar writes, “Just months before the World Cup, Chappell had come to see me at home and, to my dismay, suggested that I should take over the captaincy from Rahul Dravid. Anjali (Tendulkar’s wife), who was sitting with me was equally shocked to hear him say that ‘together, we could control Indian cricket for years’, and that he would help me in taking over the reins of the side. “I was surprised to hear the coach not showing the slightest amount of respect for the captain, with cricket’s biggest tournament just months away,” Tendulkar writes. So disgusted was Tendulkar with Chappell’s suggestion that a few days after the episode “I suggested to the BCCI that the best option would be to keep Greg back in India and not send him with the team to the World Cup”. 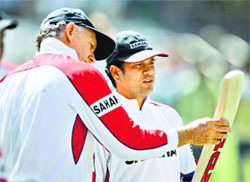 Tendulkar had suggested to the Board that the senior players could take control of the side and keep the team together. “That is not what happened, of course, and the 2007 campaign ended in disaster,” he writes in the book, excerpts of which were made available by the publishers. India’s 2007 World Cup campaign ended in a fiasco with the team winning only one of the three group matches against lowly Bermuda, and losing to Bangladesh and Sri Lanka. Lashing out at Chappell, Tendulkar says that the Australian must take a lot of responsibility for the mess resulting from India’s performance in the World Cup. “I dont think I would be far off the mark if I said that most of us felt that the Indian cricket was going nowhere under Chappell. Chappell was publicly questioning our committment and instead of asking us to take fresh guard, was making matters worse,” writes Tendulkar. Just months before the World Cup, Chappell had come to see me at home and, to my dismay, suggested that I should take over the captaincy from Rahul Dravid. Anjali (his wife), who was sitting with me was equally shocked to hear him say that ‘together, we could control Indian cricket for years’, and that he would help me in taking over the reins of the side. Chappell is on record as saying that he may have got the job because of Sourav but that did not mean he was going to do favours to Sourav for the rest of his life. Frankly, Sourav is one of the best cricketers India has produced and he did not need favours from Chappell to be part of the team. On one occasion, he asked VVS Laxman to consider opening the batting. Laxman politely turned him down, saying he had tried opening in the first half of his career because he was confused, but now he was settled in the middle order and Greg should consider him as a middle-order batsman. Greg’s response stunned us all. He told Laxman he should be careful, because making a comeback at the age of thirty-two might not be easy. However, the Delhi left-hander refused to be drawn into comparison between who was a better opening partner between Rohit and Rahane. “I enjoy batting with both of them. Hopefully, they too enjoy batting with me. Both have their own styles. As far as my opening partner is concerned, it’s a team’s call and I can’t answer that. I love batting with both of them. When Rohit and I used to open, we used to do the same thing,” said Dhawan. Dhawan found his touch during the final leg of the England ODI series, got a half-century against West Indies in the truncated home series, and now reached the three-figure mark against Sri Lanka in the first ODI on Sunday. “When you play such a knock, self-confidence gets a big boost... it’s a happy feeling,” Dhawan added. Even as the Indian bowlers had the luxury of defending a huge total of 363/5, Dhawan was effusive in his praise for the manner in which the pacers intimidated the opposition. New Delhi: Former India captain Rahul Dravid today said that he would like to see his statemate and new batting sensation KL Rahul make it to the Indian Test team for the tour of Australia along with talented Railways leggie Karn Sharma. “He has scored over 1000 runs in the domestic season, looks in really good form with twin hundreds in the Duleep final, so if you are going to give a youngster an opportunity, it’s good to pick him if he’s in good form and actually playing well. You are picking him, at least initially, as a back-up opener,” Dravid said. Having set the visitors an improbable 603-run victory target, Pakistan claimed the remaining six wickets in a little over a session on the final day to secure their first Test series victory against Australia in 20 years. The win also saw them leapfrog England, Sri Lanka and India to rise to number three in Test rankings, behind South Africa and Australia. Smith (97) added 107 runs with Mitchell Marsh in a rare display of Australian resistance in the two-match series before his post-lunch dismissal triggered a collapse with the visitors losing their last five wickets for only eight runs to be all out for 246. “I think Misbah-ul-Haq and his team played some outstanding cricket in both Test matches and we’ve certainly been outplayed,” Australia captain Michael Clarke said. Zulfiqar Babar (5-120) and Yasir Shah (3-44) once again laid bare Australia’s spin frailties even though Pakistan were without their main spinner Saeed Ajmal who has been banned for an illegal action. Pakistan captain Misbah was adjudged man-of-the-match for his twin centuries in the match. 20 years is the time Pakistan took win a series against over Australia. Last time they won a series was way back in 1994. 356 Runs is the margin of victory, Pakistan’s biggest ever against any opposition. Their previous best in terms of runs was against India — 341 runs in 2006. 14 Test wins put Misbah-ul-Haq alongside Imran Khan and Javed Miandad as Pakistan’s most successful Test skipper. 6 Tests lost on the trot — Australia’s sorry run in the Asia. If Bangladesh is taken out of the equation, the Aussies have won just one Test in Asia in the last ten years. Senior counsel Raju Ramachandran handed over the final report to a Bench headed by Justice TS Thakur in sealed covers. Without opening the covers, the Bench said the report would be considered at the next hearing, slated for November 10. The findings could not be ascertained as Justice Mudgal and other panel members were tight-lipped about the contents. Srinivasan had stepped aside as BCCI chief in March 2014 following the panel’s interim report, indicting his son-in-law Gurunath Meiyappan who was the team principal of IPL franchise Chennai Super Kings. The SC then appointed Sunil Gavaskar and Shivlal Yadav as joint acting chiefs of BCCI, asking Gavaskar to conduct IPL 2014 and Yadav to handle other affairs of the Board. Gavaskar was relieved from his position at the conclusion of the IPL matches. Some of the best athletes in the country, including the likes of quartermilers MR Poovamma, Ashwini Akkunji, Mandeep Kaur and Sini Jose and middle and long distance runners like OP Jaisha, Kavita Raut and Ghamanda Ram, are competing at the four-day meet, but they all are subjected to step-motherly treatment at the hands of government officials. The reason — with the Indian Super League (ISL) football matches being held at the same venue, the Sports Authority of India (SAI) has decided to host the throwing events — javelin, shot put, discus and hammer throw — in the warm-up area and not inside the main stadium. The stadium, which was built at a staggering cost of Rs 1,000 crore for the 2010 CWG, is the home of Indian athletics, but for the stadium’s administrators — in this case the SAI — the ISL matches are more important than hosting the CWG and Asiad medallists, and more importantly, the athletics championships after a gap of 10 years in the Capital. “How could you expect the likes of Asiad gold medallist in discus throw, Seema Punia, to compete outside the main arena in a practice zone? And that too without any spectators watching her? It’s a shame,” AFI secretary general CK Valson told The Tribune. Apalled by the sub-standard facilities provided to participants at the meet, legendary sprinter PT Usha lambasted the SAI officials for the shabby treatment of athletes. The celebrated athlete, here as Tintu’s coach, was left stunned by the apathy of the officials and ill-timed event. “There was mud at the track after some 300 metres. Tintu cleaned it up before the start of her final. The running track is not in good condition. She could have picked up a career-threatening injury. This is an ill-timed event. The AFI should have organised it before the CWG and Asian Games,” Usha said. The AFI also launched a scathing attack on the SAI and complained about the shoddy treatment meted out to athletes. “Had it (stadium) been in our control, we would have made the event more glamorous and colourful. You need better facilities to encourage athletes. We have been asked to conduct throwing events outside the arena. SAI must understand that these are all CWG and Asian Games medallists. It’s a sorry state of affair,” Valson said. “If the football organisers have spent money to get the stadium, we are also hosting the biggest event in our national calendar. You get future athletes from these meets. The SAI should be more concerned about giving the stadium to the athletes, than to publicity-hungry games,” he added. It was his 32nd career win, which made him the most successful British driver of all time after he had equalled Nigel Mansell's record last time out in Russia. “Well done you guys, you all did a fantastic job and this is thanks to you,” a delighted Hamilton told his crew over the radio as he pumped his arms in the air and savoured his second success on American soil. It was not all plain sailing, though, as Hamilton went to the line still concerned about both his brakes and his left front tyre, having suffered wheel locking and a resultant flat-spot in qualifying. And as expected, Rosberg blasted into the lead from the cleaner side of the grid at the start. Hamilton was able to fend off the Williams of Valtteri Bottas which started third, also on the cleaner side, but almost immediately the race was neutralised by the safety car after Sergio Perez's Force India crashed into Adrian Sutil's Sauber. The Mexican was able to limp back to the pits, but the German's car was stranded on the track. During the four-lap intervention debris was also cleared up, but not before Sebastian Vettel, who had started from the pits, ran over some and suffered a puncture. Jenson Button also ran over it and suspected for the rest of the race that he'd damaged his McLaren's floor. 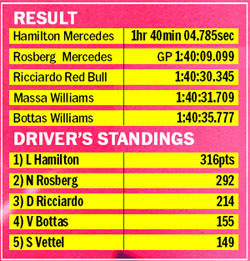 When the race resumed, Rosberg began easing away and was in control of the race up until the first pit stops. His came on the 15th lap, Hamilton's on the 16th, and when they were back up to speed the German was still 2.5sec ahead of the Englishman. Force India's Perez handed seven place grid penalty for Brazil. Mexico's Sergio Perez will have a seven place starting grid penalty at next weekend's Brazilian F1 GP as punishment for reckless driving in Sunday's U.S. race. The Force India driver retired after a first lap collision with Sauber's Adrian Sutil that dumped the German out of the race and forced the deployment of the safety car while debris was cleared. 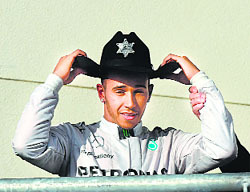 Perez was also handed two penalty points. A number of top athletes, who had entered their names for the season-ending event, pulled out before the start of the competition at the Jawaharlal Nehru Stadium. Asian Games silver medalist Manju Bala opted out of the women's hammer throw event. KT Irfan, the national record holder in the 20km racewalk event, too withdrew his name, citing a swelling in his ankle. Others to miss the meet include National record holder and 2010 CWG gold medallist, Krishna Poonia, and Guangzhou Asian Games gold medallist in the 10000 meter event, Preeja Sreedharan. Another Asian Games silver medalist, Khushbir Kaur, left the race midway on Sunday when her coach Alexander Artsybashev stopped her from competing further, citing the danger of her picking up an injury. “This (pullouts) is a very serious issue and we are going to take a strong action against all such athletes. We are thinking of imposing heavy fines on the concerned departments, which send athletes to the national meet. We want to send a strong message to these athletes before the next competition,” AFI secretary general CK Valson told The Tribune. Valson said the last-minute pullout by the athletes has disturbed the entire schedule of the meet. “We are facing a lot of difficulty in re-scheduling the events. These withdrawals had resulted in no continuity in the track and field events. The departments like Services and Railways put all their experienced athletes in the initial list of competitors, but when it comes to real competition, they pull them out. The international rule says if you don't participate in one event, you cannot participate in any other event in the competition. But these departments are not bothered. As organisers, we don't know who the real athletes are,” he added. Railways had sent the maximum number of entries with 118 athletes, while All India Police sent 99 participants. Long jumper Ankit Sharma grabbed the headlines as he equaled the 16-year-old meet record set by Sanjay Kumar of Railways. Ankit leapt to 7.87m in his penultimate jump to upstage national record holder Prem Kumar, who was pushed to third place with an effort of 7.53m. In the women's events, Tintu and MR Poovamma ended the season on a high. The Incheon Asian Games medallists ran well below their personal best, but that was enough to clinch the gold. Luka, representing the Railways, clocked 2:03.88 to win gold in women's 800m race, while ONGC's Poovamma came first in 400m in 53.59 seconds. Services Sports Control Board's (SSCB) Kunhu Mohammed resisted stiff competition from Asiad bronze medallist Arokia Rajiv to win the top spot in the men's 400m event, clocking 46.97 seconds. Rajiv came in second with a time of 46.99 seconds while Bibin Mathew came third, clocking 47.83. Goossens scored the decisive goal in the 88th minute as he headed home after Dudu Omagbemi's shot hit the crossbar and rebounded at the Shiv Chhatrapati Sports Complex Stadium. NorthEast United, who had come here after impressive shows against Mumbai FC and Delhi Dynamos in their away matches, had more ball possessions but they had very few scoring chances. With the win, Pune FC jumped to the fourth spot with seven points from five matches while NorthEast remained on third position with eight points from six matches. Joan Capdevila and Koke returned for NorthEast United after missing out against Delhi Dynamos in their last match but the visitors failed to dominate over the home side. Instead, Pune FC looked like the side which would score. NorthEast United goalkeeper T P Rehenesh, who saved at least three brilliant saves against Delhi Dynamos, was also up to his task today, including a brilliant save of a Davide Colomba shot on the line. Greek World Cupper Konstantinos Katsouranis was impressive at the centre of the park for Pune while winger Israel Gurung made some threatening moves. Both teams endured a nervy start but Pune settled down sooner. The visitors later picked up the tempo and threatened on the counter. A contingent of 49 individuals — including 18 men’s team players, 19 women’s team players, coaches, umpires and the manager – had crossed the border yesterday at 10 am. “We had crossed walking into the Indian territory, where the organisers of the hockey tournament were there to receive us. Hardly had we reached and settled in our rooms that we got to know that there had been a blast at the site that we had crossed hardly nine hours earlier,” said Olympian Anjum Sayeed, manager of the teams. A third-time visitor to India for the tournament, international umpire Atif Malik too said that the team had been distressed at the news. “We all had come here to give a message of peace and brotherhood. But no sooner had we reached, we started hearing about the stepping up of tension all over again. As a member of the contingent, I talked to everyone and told that come what may, we have to show the spirit of sportsmanship and do our duties well,” he said. Sayeed added, “Our players were also a bit shaken watching news on TV and in the papers in this morning. But then I counselled them and told them that they must continue to practise and perform to the best of their abilities.” The Pakistani men’s team, which includes five Olympians, expects to do well in the tournament, said vice-captain Waqas Sharif. In women section, RCF Kapurthala registered their second consecutive victory beating Haryana XI 6-3. In men's section, last year's runners-up Indian Oil Mumbai beat RCF Kapurtahala 5-3. In the 10th minute, Indian Oil's Parabhjot Singh netted the ball from left flank (1-0). In the 15th minute, Indian Oil's Vikas Sharma scored from the top of the circle (2-0). In the 20th minute RCF's Simrandeep Singh converted the penalty corner to reduce the margin (1-2). In the 22nd minute, Indian Oil's Sunil Yadav sounded the board with a penalty corner conversion (3-1). At half time Indian Oil was leading by 3-1. In the 49th minute of the second half, RCF's Raman Singh netted the ball from right flank to make it 2-3. In 61st minute of the play, Indian Oil's Gagandeep Singh scored the goal via penalty corner conversion (4-2). In 66th minute, IOC found another goal through Gagandeep Singh to make it 5-2. In the dying minutes of the game, RCF's Sanjay Bir reduced the margin to 5-3. In the second match in men section, Punjab Police Jalandhar, after losing their first match to Army XI, beat Bharat Petroleum Mumbai 4-2. Punjab Police took lead in 13th minute when Captain Simranjeet Singh converted the penalty corner (1-0). In the 27th minute, Jagmeet scored a field goal for Punjab Police (2-0). In the 33rd minute, Bharat Petroleum reduced the margin through Harjeet Singh. Margao: Salgaocar FC are the second team to qualify for the semifinals after they played out a 1-1 draw against Tuff Laxmi Prasad in a Pool A quarterfinals of the 127th Durand Cup on Monday. After N D Opera put Tuff Laxmi Prasad in the lead in the 28th minute, Ouhou Peirre restored parity for Salgaocar FC in the 44th minute. Salgaocar, who needed a draw to top the group, collected four points from two matches and made it to the knockout round. 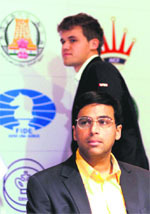 New Delhi: Five-time world champion Viswanathan Anand will start as the underdog but has the backing of the chess world this time to put up a better show in the re-match for the World Chess Championship that starts in Sochi, Russia, on Friday. “This time it will be much closer than last time,” says Arjuna awardee Grandmaster Abhijeet Gupta, who gave Carlsen the tag of ‘favourite’. Anand, who qualified for the rematch by surprisingly winning Candidates’ Tournament earlier this year, backed his performance in the qualifier by winning the Bilbao Final Masters too and seems to be in fine nick ahead of the clash. Carlsen, on the other hand, has not had the best of times recently, although his winning the Qorld Rapid and Blitz title was nothing short of a miracle that made the Norwegian the first player in history to be world champion in all three formats — Classical, Rapid and Blitz — simultaneously. Manila: Jeev Milkha Singh is looking forward to a winning debut at the $1 million Resorts World Manila Masters presented by 918.Com later this month when he returns to a country which holds fond memories for him. The 42-year-old has committed to the full-field Asian Tour tournament at the Manila Southwoods Golf and Country Club from November 20 to 23 where he will be seeking a seventh Asian Tour title. “I’ve not been back to the Philippines for years and I’m looking forward to playing in the Resorts World Manila Masters,” said Singh, who is an Asian Tour Honorary Member. Barcelona: Cristiano Ronaldo needs one goal to match the Champions League's all-time leading scorer when Real Madrid hosts Liverpool. At the rate the forward is sweeping in goals, Ronaldo has a good chance to match and even break Raul Gonzalez's mark of 71 goals in front of the same Santiago Bernabeu crowd that used to chant Raul's name. Madrid would qualify for the knockout rounds with a second straight win over Liverpool in Group B. Bayern Munich, Chelsea, Barcelona, Arsenal, Borussia Dortmund and FC Porto can also advance from the group phase this week, leaving two games to spare. New Delhi: After the success of Mary Kom, former India hockey captain Sandeep Singh is the latest sportsperson on whom a biopic has been planned and the ace dragflicker wants Ranbir Kapoor to portray his role in the movie. Actress Chitrangada Singh is set to turn producer with this planned film. “Chitrangada Singh has bought rights for making a film on my life. I am very excited that people will see my story on celluloid,” Sandeep, who is currently playing for Hampshire county in UK, said.